Shrikant Bangdiwala researches nonparametric methods and graphical techniques for assessing reliability and validity. He specializes in the coordination of multicenter clinical trials and large epidemiological studies in diverse areas, from cardiovascular disease, gastrointestinal and functional bowel disease, HIV-AIDS, injury and violence. 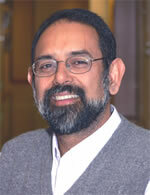 Dr. Bangdiwala holds a PhD in Biostatistics from the University of North Carolina at Chapel Hill. In addition to other appointments at UNC, he serves as a senior faculty consultant to the Biostatistical Support Unit of the UNC Center for Health Promotion and Disease Prevention. He has received three Fulbright Research and Lectureship awards, and currently is a designated Fulbright Senior Specialist in Global Public Health. He holds visiting professor appointments at the University of Chile (Santiago), the University of Valparaiso (Chile), and the Karolinska Institutet (Stockholm). Dr. Bangdiwala is a member of the Board of Scientific Counselors of the CDC’s National Center for Injury Prevention and Control. He is the author or co-author of more than 130 scientific peer-reviewed articles.